Your ad in the Saturday Review of Literature says that you specialize in out-of-print books. The phrase 'antiquarian book-sellers' scares me somewhat, as I equate 'antique' with expensive. I am a poor writer with antiquitarian taste in books and all the things I want are impossible to get over here except in very expensive rare editions, or in Barnes & Noble's grimy, marked-up school-boy copies. I enclose a list of my most pressing problems. If you have clean, secondhand copies of any of the books on the list, for no more than $5.00 each, will you consider this a purchase order and send them to me? And so a beautiful relationship between two extremely different bibliophiles is born. Helene can only be described as your typically eccentric and brash New Yorker who manages to slowly chip away at the equally typical professional British reserve of Frank Doel with her witty requests and sharp retorts. Even from this very first letter, I'm sure Frank Doel was able to paint a pretty clear picture of Ms. Hanff: unafraid and full of dry wit. An assessment that would have been spot-on as her later letters revealed a woman brimming with hilarity and intelligence alongside an astonishing fullness of heart. As Helene would often not only send her trademark letters of sarcasm and good-humor but packages of rationed foods for her British friends too. At different times I giggled, I cried, and above all I marveled at the profound reverence Helene and Frank shared for the written word. 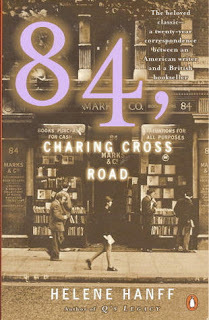 84, Charing Cross Road is such a perfect little volume, one that will find a home in any bibliophiles' library. Immediately after finishing, I just had to Netflix the movie adaptation, which of course was excellent and probably one of the most brilliant casting decisions regarding Anthony Hopkins (who just happens to be one of my top leading men) that I've ever seen. If you need any more prodding to pick up this delightful book, I recommend giving the movie a chance, I don't see how it could fail to bring a smile to anyone's face. *sigh* The scene in the movie when she's sitting in her apartment surrounded by her books? Kills me every time. Why have I not heard of this book before? It looks like something that I'd really enjoy reading. Adding it immediately to my wihslist. Don't you love Helene? She's got great wit. Love the film too. Nice review. Angie - the movie was just perfect all around in my tastes. So lovely. Chachic - Oh YES! You'd love it for sure, and I bet you could get a used copy for cheap. Holly - Actually the letter you quoted on your review is one of my favorite parts too. I kept going back and rereading it every day or so. Love it all. Guess who is getting a book?